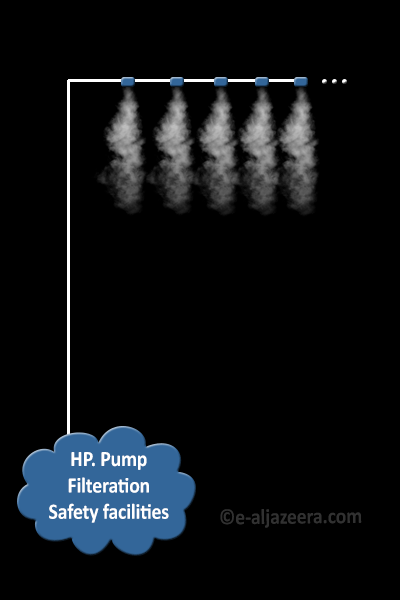 High pressure misting systems, in its simplest form, could work with water and pump. It is more effective than conventional methods for cooling outdoor locations like a green house, patio, waiting line, dining area and other suitable are it may use. And these system have been used in Dubai for a long time. The concept incorporates water and heat to provide cooling application through “flash evaporation”. It works with mist nozzles that operate under high pressure to produce tiny water droplets which reducing the air temperature. The stainless steel mist line provides cooling effect to the area from high-pressure pump assembly. Misting system can achieve maximum cooling without wetting or residual moisture. It can also provide a dynamic visual effect to any home patio, or commercial location. We offer different brands to provide one of the various options of Misting equipment and components for home or commercial use. We can handle any indoor or outdoor home, patio, green house, industrial, or commercial cooling application.